Economy.my: Partying like it's 1995? 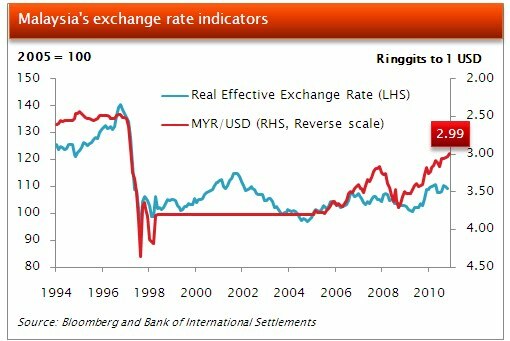 Looking for more appreciation as it seems that Bank Negara will probably hike rates sometime this year, and more USD weakness as America's Federal Reserve's QE2 programme is on its 2-month home stretch. Heck, it's a step forward in improving our purchasing power (about time too!) It sorta compensates for our rather inflexible labour markets here. BNM annual report seems to think that our local firms can handle this appreciation for now, so all good right now I guess. P/s: I actually meant to talk about this thing about global rare earths trade, but I think this is a lot easier to swallow for the start of the week. Not so sure, there's lots of things at play right now. We've got a rather conservative Central Bank, the US Federal Reserve that's gung ho on accommodative monetary policy and our persistent trade surplus. My guess is, we'll probably get a better view of where this is heading after QE2 is over.